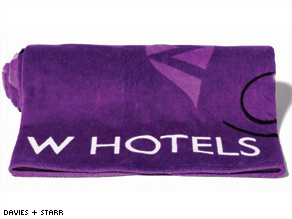 Is it OK to steal hotel amenities? (Travel + Leisure) -- I stole a laundry bag from the Alvear Palace Hotel in Buenos Aires. It was made of thick ivory linen, embroidered with the words "dry cleaning" in cerulean blue, and looked like something that I could have found at an antique textiles show. But that wasn't the case. I'm usually pretty scrupulous about purloined souvenirs. Of course, I help myself to soap and shampoo, sewing kits, even those black sponges meant to spruce up your shoes -- oh, and ballpoint pens and darling little notepads. But the laundry bag was my first sojourn into the land of, what shall we call it ... outright theft? How widespread is this brand of petty larceny? A brief survey of my acquaintances -- a glass of wine, or three, helped them remember -- reveals that B. (names are omitted for patently obvious reasons) spends an inordinate amount of time at her favorite inn in St. Bart's hoarding the Hermès soap (using the same one for the sink and tub and then pilfering the other), and K. became so addicted to the slippers at the Sofitel Paris Le Faubourg that she now begs peripatetic friends to bring back their extra pairs. Both of these tales were recounted in voices dripping with shame -- which, it turns out, was entirely uncalled for. The truth is that even the most parsimonious innkeepers want you to take their grooming products and paper goods home, the thinking being that every time you use an item that bears the hotel's name you'll remember what a wonderful time you had there and plan another visit (and not just to take more stuff). François Delahaye, general manager of Paris's Hôtel Plaza Athénée, confirms that the shampoo, shower gel, slippers, of course, and even ashtrays (remember those?) are good to go. Delahaye says anything with the hotel's moniker is extra-desirable. "If you want it stolen, put your logo on it," he tells me. Usually, he says, hotels shrug off minor light-fingeredness; it's just part of the cost of doing business. But sometimes it gets on even his steady nerves. Lately, he says, there has been such an epidemic of filched silver tea strainers that "it's become a nuisance." Okay, François, what about my laundry bag? Was my misdeed really so awfully naughty? Silence, then a most surprising confession: Turns out that way back in the day, Delahaye once helped himself to a laundry bag at a Rosewood hotel. This mischief, though hardly sanctioned by the property, had the desired effect. "Whenever I use it," Delahaye says, "I'm thinking about that Rosewood." Lifting laundry bags is nefarious enough, but it's hardly world-class in the hotel-theft department. For that we must turn to the notorious saga of the bad, bad girl who told me in hushed tones that, while she was staying in a room with two beds at the Setai in Miami, she proceeded to carefully remove the Christian Fischbacher satin sheets from the unused bed, then meticulously remake it so as not to alert housekeeping. Or there's the story of the Kiton-suited banker who never met a wooden shoe tree he didn't like enough to take back with him to Park Avenue. Now you'd probably think that even the most unscrupulous guest couldn't walk off with a nailed-in showerhead. Guess again. Andrew Stembridge, managing director of Chewton Glen, a manor hotel nestled in England's Hampshire countryside, says he's had visitors unscrew all types of furnishings, including the big bottles of Molton Brown lotion affixed to the spa's walls. Stembridge cheerfully volunteers harrowing tales of people pocketing silver sugar tongs and helping themselves to the iPod docks available at reception. "Sometimes the culprits are the fanciest people; it's not the guests on the special Sunday night rate. We just factor it in," he shrugs philosophically. On the other hand, Stembridge is not afraid to fight back. Once, when an antique cup and saucer went missing from a room, he confided that he actually riffled through the guests' luggage, which had been stored as they took a final spin around town. "They had a lovely leather bag falling to bits," he remembers. As he suspected, the dishes were indeed packed in the crumbling old bag, but any triumph Stembridge felt at their retrieval quickly vanished when he realized "I couldn't zip the case!" He finally managed to close it, just minutes before Bonnie and Clyde returned. That crockery wasn't for sale, but the good news is that plenty of coveted items offered by hotels can be yours, legitimately, for the swipe of a credit card. Have sweet dreams of the bed at the Four Seasons? Everyone knows you can order it. Develop an unwholesome relationship with the Perspex mini-mannequin lighting at the Soho Hotel in London? The property can arrange a set for you. And what about that classic stuff-it-in-your-suitcase item, the terry robe? Plaza Athénée's Delahaye says that this is actually a much smaller problem than it was a decade ago, since there is frequently no room in today's carry-ons for these puffy behemoths. Do hotels really charge for swiped robes, making good on the threat implicit on those little signs in the bathroom? Since I have learned the hard way that a diet Coke gulped on the sly the final day of your stay will almost surely show up on your bill, I have always wondered about the robe scenario. As it turns out, sometimes resisting temptation can be just as haunting as giving in to one's base instincts. My friend P., who has been traveling longer than many of us have been alive, recalls wistfully, "As you know, hotels of a certain caliber turn down the bed at night and put little linen towels down so your feet should never, heaven forbid, touch the carpeting. Not only did they do that at the Ritz in Paris, but they put down a second one for my dog. It had a bone embroidered on it with the words 'I Am Ritzy.' I didn't take it and, to this day, I regret it." Maybe he should have just folded "Ritzy" into his Goyard duffel. Then he and Fido could have dreamed of the Ritz as they rested their tootsies back home, just as the sight of my ill-gotten Argentinean laundry bag has me fantasizing about dancing the tango at 2 a.m. in the grand ballroom of the Alvear Palace.